Reference number for this case: 27-Oct-54-Saint-Marcel. Thank you for including this reference number in any correspondence with me regarding this case. , on October 29, 1954.
territory of the municipality of SaintMarcel. REFERENCE: Legion Note Nr 2998/2 of 12.10.1954. On 27 October 1954, on returning from an overnight service, the gendarmes , of the brigade , reported to their Brigade Commander that, being on County Road No. 40 between Saint-Marcel and Haudrecy, they had seen, as they arrived at the crossroads formed by C.D.9 and C.D.40, the take-off of an unidentified craft. This "phenomenon" would have occurred at 5:15 a.m.
At 7.45 am, the Brigade Commander visited the place accompanied by the gendarme . Informed in his turn, the Section Commander visited the scene at 1:30 pm with the gendarme . At the supposed location of the landing of the craft (map 50,000 - Type 1922 - Renwez - coordinate MF 27.34 - 33.62) we noticed on the ground, a substantially rectangular location of 1 M 60 by 1 M 30, where the grass is flattened. In addition, at 3 M 50 of this site, a grazing fence was torn over a length of 25 meters. Four stakes of the pasture are deteriorated; including two broken at ground level. The wires and stakes in question seem to have been broken and torn as if they had been dragged by an irresistible force. One of the wires is stretched perpendicularly to the fence for a length of six meters and against the presumed location of the craft. The cattle parked in this meadow having wandered on this site after the deterioration of the fence, no trace was detected that could originate from the craft. 150 meters, a sheaf of sparks, accompanied by a whistling sound and followed by a slight purr sound. This spray of sparks was about 1 meter long and was 1 meter from the ground. The noise went away in the direction of Ham-les-Moines, that is to say towards the Northeast. I saw no form or any other glimmer than that of the sparks which lasted a fraction of a second. With my comrade, I approached the presumed place, I saw close to this place, in a pasture, cows frightened and bellowing. These were all gathered on the edge of the grass near C.D.9. I did not notice anything else and did not penetrate inside the meadows. As soon as the craft had left, I had a moment of stupor, I got off the bicycle and with my companion, we observed about ten minutes to see if a glow would appear. I did not believe in flying saucers, but although having seen no craft, I am now certain that something started from this place with tremendous speed. "On October 27, 1954, at about 5:15 a.m., while I was performing a night service under the orders of the Gendarme  and I was using the C.D. 40, back from Saint-Marcel, and being about ten meters behind my comorade, I was riding y bicycle, the headlight of my machine turned off, the night was dark and the Gendarme  asked me, being 30 meters before arriving at the crossroads that is formed by the C.D.40 with the C.D.9, what was the nature of a white spot huddled in the grass, as I had just recognized a cat, and I answered him, and my companion did not understand. I said in a loud voice: "It is a cat." At that moment a sparkle of sparks, accompanied by a whistling sound, occurred, and the sparks were preceded by a detonation similar to that of a firecracker. The whistling sound was followed by a gentle purr sound that went away in a northeasterly direction. The sparks had occurred towards our left front at about 150 meters and about one meter from the ground. This trail of fire was about 5 meters long. We approached the presumed place of these facts, and saw nothing more. The cows in the meadow began to bellow and gathered near the barrier. It was clear that these animals were afraid. This place being very well known and usually deserted, my first movement was that of surprise and I stopped my bicycle then observe in order to have clarification on the cause of the facts recounted above. Unquestionably, I was oppressed because the idea that immediately imposed on my mind was of finding myself in the presence of a "flying saucer". However, apart from the startling start I witnessed I saw no form whatsoever." The two "visionary" gendarmes are serious and well balanced and can be trusted. It was on purpose that the Commanding Officer took the other gendarme on the spot a few hours later. But the statements are by no means contradictory. to mention it, because they feel that it is because they made noise that the mysterious machine started. Perhaps it was a mere coincidence, but perhaps also the craft was inhabited. The event having been witnessed only by the two gendarmes, did not arouse emotion among the local population, only the owner of the pasture, Sir , of Saint-Martin seems to have taken the thing seriously. He considers it impossible that the deterioration observed at his fence could have been made by his cattle. It is also the opinion of the drafter of this report. Oct. 27, 1954 Mezieres (France). Policemen saw a craft, which took off from the ground. No details were given. (Personal). Gendarmes saw a machine taking off from the ground. No details were given (Personal). 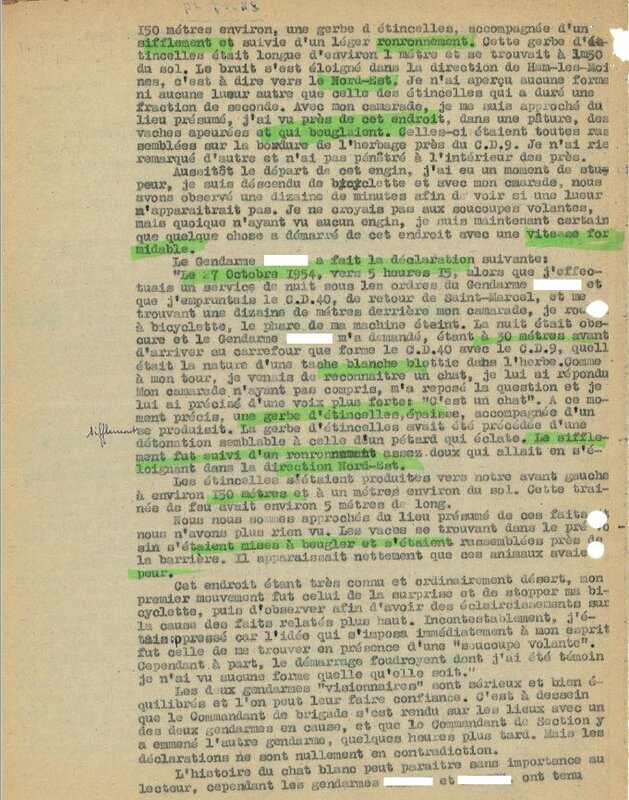 The two ufologists authors, based on their personal file and the report by the gendarmerie, provide the summary of the observation of October 27, 1954 at 03:00 P.M. in Saint-Marcel in the Ardennes, whose witnesses are two gendarmes of the brigade of Renwez who were on patrol. The gendarmes were at the crossroad of the departmental pathways CD 40 and CD9 when they saw a machine taking off of a meadow while launching a shower of sparks, at approximately 150 meters of them. The gendarmes had heard a whistling sound which had changed in a gentle humming noise. The cows in the nearby meadows acted crazy. The machine took off at a "formidable speed." The two gendarmes at once alerted their brigade's commander who in turn alerted the captain who commanded the brigade of Mezières. Their brigade's commander arrived on the location at 05:45 P.M., the captain of the brigade of Mezières arrived at 13:30. The investigators found very clear traces, of an about rectangular site of 1 meter 60 out of 1 meter 30 of flattened grass. At 3 meters 50 of this trace, a fence of a pasture was torn off over a 25 meters length. Four stakes were unearthed, of which two were broken at the level of the ground. On October 27, 1954, while on patrol, two gendarmes [police attached to the Army] from the brigade of Renwez (in the Ardennes) see a machine taking off of a grass field, at approximately 150 meters distance from them, the machine rises launching a shower of sparks, while the gendarmes hear a whistling sound. Very clear traces were documented: an roughly rectangular site of 1,60 m by 1.30 m, where the grass was flattened. At 3,50 m of this site, a grazing ground fence was torn off on 25 meters length. Four stakes were damaged, including two broken on the level of the ground. The two authors indicate that in Saint-Marcel in the Ardennes, on October 27, 1954 at 03:15 p.m., two gendarmes of the brigade of Renwez were in patrol and arrived at the crossroads of the departmental road D40 and the departmental road D9, and the road which goes to the village of La Grève. There they saw an unknown apparatus which took off from a field within 150 meters of them, while launching a shower of sparks. A whistle was heard, which changed into a light humming, then the machine rose at a fantastic speed. The commander of the brigade of Renwez alerted the commander of the company of Mézières. The investigators discovered very clear traces: a rectangular sector of 1,60 m by 1,30 m where the grass was flattened. Within 3,50 m of this sector, a fence of the pasture was found torn off over a 25 meters length. Four stakes were found deteriorated, including two that were broken and lay on the ground. In the meadows neighbouring the place of the landing, the cows had become "like insane." The authors indicate that their sources are Vallée, Garreau and Lavier. The Belgian ufologist indicates that in 1954, on October 27, in France, in Saint-Marcel (the Ardennes) "At 15:15 two gendarmes of the brigade of Renwez in patrol arrive at the crossroads of the C.D. 40 and the C.D. 9. At this moment, a machine takes off from a meadow at approximately 150 m of them while launching a shower of sparks. They hear a whistling sound which changed into a light humming. In the nearby meadows the cows are like insane. Traces on the ground." The source is indicated as "GARREAU et LAVIER: " Face aux extra-terrestres" - DELARGE 1975 - p. 100, 101". In Mézières (France), gendarmes see 1 craft that takes off the ground. 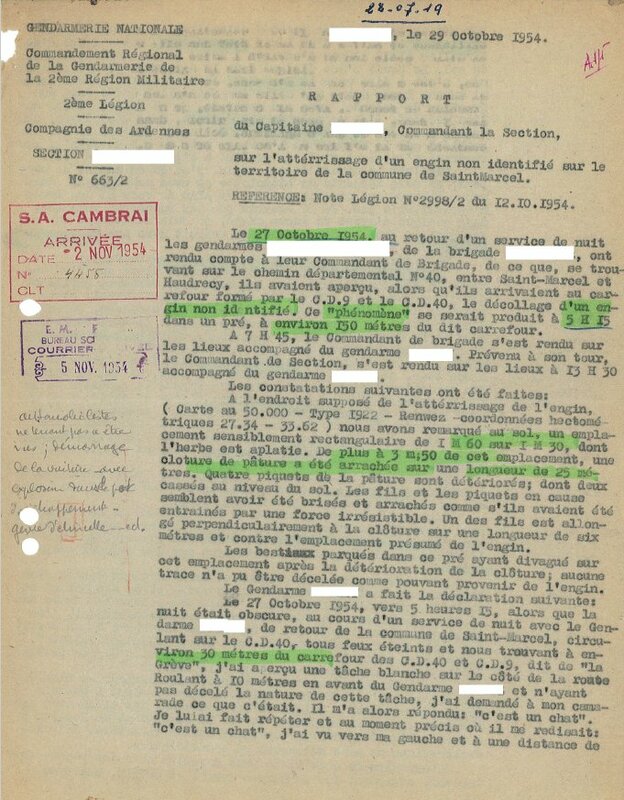 Eric Maillot re-examines the cases noted by Jean-Michel Ligeron and indicates that on October 27, 1954, "towards 5h15 in St-Marcel towards Haudrecy D9XCD40, (nocturnal CE2) "there was a phenomenon described as a shower of sparks at 1 meters above the ground, a detonation of the petard type of a very short duration of several seconds maximum, and noises of whistle heard during then humming heard after the disappearance of the object going towards the North-East and the distance being of 150 meters. He indicates that the claimed effects are the fear and the lowing of the cows, and an almost rectangular trace of 1.6 by 1.3 meters of flattened grass, a fence of the cow's pasture damaged or torn off on 25 meters, and that sounds were heard. He indicates as explanation a whirring meteor seen in clear ground with an illusion of proximity or a possible fireworks rocket of a possible local party or to play a prank "at the constabulary" or the takeoff of a jet Djinn [helicopter], increased by a media influence for the flying saucers, the deterioration of the fence being caused by the cows and the rectangular trace being possible caused by a feeding trough. He adds that no solid object was seen, and that the case is one of two having a formal report by the gendarmerie in the 1000 cases of the statistical analysis by Claude Poher. 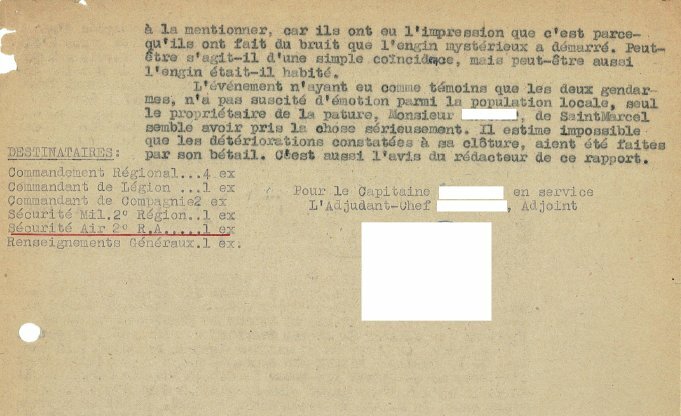 Luc Chastan indicates that in the Ardennes in St Marcel on October 27, 1954 at 15:15 hours "Two gendarmes of the brigade of Renwez in patrol, arrive at the crossroads of D40, D9 and the road which leads to the village of La Grève; they then see an unknown apparatus which takes off from a field at 150 meters of them, while launching a shower of sparks. A whistling sound is heard, it changed into a gentle humming sound, then the machine rises at a fantastic speed." "The commander of the brigade of Renwez alerts the commander of the company of Mézières. The investigators discover very clear traces: a rectangular sector of 1,60 m by 1.30 m where the grass is flattened. At 3,50 m of this sector, a fence of a pasture is torn off over a 25 meters length. Four stakes are deteriorated, including two broken at near-ground level." "In the meadows neighbouring the place of the landing, the cows became 'like insane'." The sources are indicated as "Ovni, Premier dossier complet... par Figuet M./ Ruchon J.L. ** éd. Alain Lefeuvre 1979" et "Les Universons par Poher Claude ** http://www.premiumwanadoo.com/universons/". The website indicates that on 27 October 1954 at 05:15 in St Marcel, France, "Police incident." And: "Animal reaction: cows afraid, bellowing and grouping in pasture. two rural police on bikes saw trail of sparks trailing about 5m, heard whistling, purring noise moving away. Minimum dist: 150m. Fence damage." And: "An object was observed. It departed by rapidly flying straight up until lost to sight. Animal reactions to the object were reported. Traces found." And: "One object was observed by two experienced male witnesses (as reported to the police) on a highway for several minutes (Depaty)." The sources are indicated as Poher, Claude, Etudes Statistiques Portant sur 1000 Temoignag, Author, undated; Hatch, Larry, *U* computer database, Author, Redwood City, 2002; Smith, Willy, UNICAT computer database. The website indicates that on 27 October 1954 in Mezieres, France, "Police incident. Policemen saw a craft, which took off from the ground." And: "Policemen saw a craft, which took off from the ground. No details were given." And: "An object was observed. It departed by rapidly flying straight up until lost to sight. Animal reactions to the object were reported. Traces found. One ball was observed by two witnesses (as reported to the police) on a highway." The website indicates that on 27 October 1954 at 05:15 in Mezieres, France, "An object was observed. It departed by rapidly flying straight up until lost to sight. Animal reactions to the object were reported. Traces found. One object was observed by two witnesses (as reported to the police) on a highway." The sources are indicated as Bowen, Charles, The Humanoids: FSR Special Edition No. 1, FSR, London, 1966; Vallee, Jacques, Computerized Catalog (N = 3073); Vallee, Jacques, Challenge to Science: The UFO Enigma, Henry Regnery, Chicago, 1966; Vallee, Jacques, Preliminary Catalog (N = 500), (in JVallee01); Vallee, Jacques, A Century of Landings (N = 923), (in JVallee04), Chicago, 1969; Schoenherr, Luis, Computerized Catalog (N = 3173); Hatch, Larry, *U* computer database, Author, Redwood City, 2002. On October 27, 1954 two gendarmes of the brigade of Renwez in patrol then see an unknown apparatus which takes off from a field, within 150 meters of the crossroads of D40, D9 and the road which leads to the village of La Grève. The machine rises at very high speed emitting a deafening whistling sound and disappears in the sky. Other gendarmes called as backup note that the grass of the meadow from where the UFO took off is curiously flattened. But, especially, that the cows of the neighbouring meadows became "like insane". Summary: Observations of a sheaf of sparks preceded by a detonation. Detection of whistling and purring sound in the NE: lack of information and corroboration. On October 27, 1954, on the return of a night service, two gendarmes riding a bicycle with all lights extinguished at 5:15 a.m. exchanged a few words aloud about a white spot seen in the grass on the right side of the road. They are then surprised to hear a detonation and then immediately see on the left side of the road, at about 150 m, a spray of sparks 1 m or 5 m long to 1 m or 1.5 m from the ground accompanied by a whistling sound and then a purr. The noise is rapidly moving towards the Northeast. No shape is seen by the gendarmes. They approach but find nothing but frightened cows that bellow. The gendarmerie investigation of the time reported that the brigade commander visited the scene with one of the witnesses at 7:45 a.m. and that the section commander did the same with the other witness at 01:30 p.m.; the two reports of the two witnesses thus gathered independently "are in no way contradictory". On the spot, the gendarmes found that the grass was flattened on a surface of 1.6 by 1.3 m and that a fence located at 3.5 m from this site was torn over a length of 25 m. Deteriorated including 2 broken at ground level). Neither the owner of the pasture nor the gendarmes think that these deteriorations are due to the cattle. The grass may have been flattened by cows before or after the observation. It is not certain that the traces on the ground are related to the phenomenon heard. A detonation followed by a sheaf of sparks and a whistle evidently reminds one of the explosion of a pyrotechnic device. The observation takes place in a geographical area traversed by various armies during the different wars. Could the self-firing of an abandoned military explosive have produced such a phenomenon without producing a crater? It is surprising that the gendarmes considered the traces on the ground of this phenomenon like the landing of an unidentified machine while they observed no shape. Would this idea have been prompted by the particularly intense media rush about the flying saucers in October 1954? GEIPAN classifies this case C for lack of information and corroboration. [jv3] "Chronique des Apparitions Extra-terrestres", French translation of "Passport to Magonia", book by Jacques Vallée, J'ai Lu publishers, France, page 290, 1972. [gl1] "Face Aux Extra-Terrestres", book by Charles Garreau and Raymond Lavier, Delarge publisher, France, pp 101-102, 1975. [cg1] "Parapsychologie ou Escamotage? ", article by Charles Garreau, in the ufology magazine Lumières dans la Nuit (LDLN), France, #179, page 3, November 1978. [fr1] "OVNI, Premier Dossier Complet des Rencontres Rapprochées en France", book by Michel Figuet and Jean Louis Ruchon, Alain Lefeuvre publisher, France, pp 200-201, 1979. [em1] "Examen critique des cas cités dans 'OVNIS en Ardennes' de J-Michel Ligeron", article by Eric Maillot, in Les Mystères de l'Est, CNEGU publisher, France, #7, page 3/11, 2002. [---] "UNICAT Computer Database", compilé par Willy Smith, USA. 1.0 Patrick Gross February 10, 2010 Conversion from HTML to XHTML Strict. First formal version. Additions [go1], [lc1], [ud1], [ud2], [ud3]. 1.3 Patrick Gross July 1, 2010 Addition [jv5]. 1.4 Patrick Gross October 19, 2014 Additon [ni1]. 1.5 Patrick Gross February 8, 2017 Additions [gn1], [ge1], [ub1]. Explanations changed, were "Not looked for yet." 1.6 Patrick Gross December 15, 2018 Additions [pr1], [lh1], [pr2].